Hau Giang (VNA) – A delegation of the Vietnam Fatherland Front (VFF) visited Sasana Rangsay pagoda in Vi Thanh city, the southern province of Hau Giang, on April 4 to extend greetings to local Buddhist dignitaries on the occasion of the traditional Khmer festival – the Chol Chnam Thmay (New Year). Talking to the dignitaries and prestigious persons in the local Khmer community, Vice President and General Secretary of the VFF Central Committee Hau A Lenh praised the Khmer people in Hau Giang for their implementation of the Party’s guidelines and policies as well as their solidarity with people of other ethnic groups in socio-economic development. The VFF official also hailed the Khmer people for preserving their cultural identity through the teaching of the Khmer language for children during summer holidays. Lenh asked the Khmer community in Hau Giang to continue participating in mass movements launched by the VFF, particularly the campaign on building new-style rural areas, to improve local living conditions. 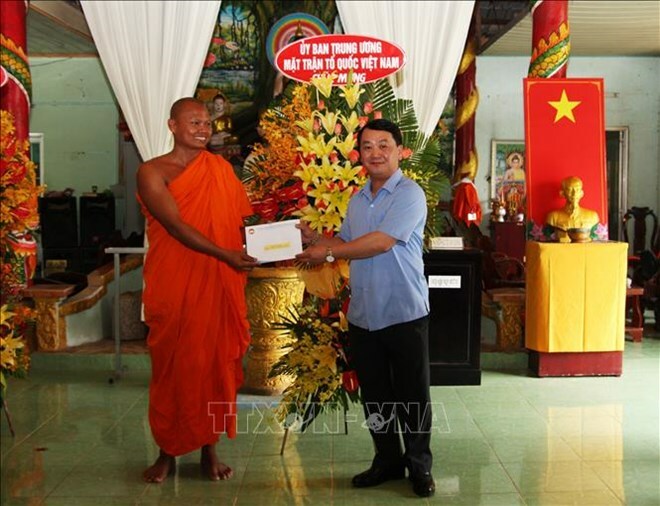 Venerable Danh Tuan, head of the provincial Association for Solidarity of Patriotic Buddhist Monks affirmed that the association will work along with the local Khmer people to enhance unity, promote study to expand their knowledge and preserve the cultural identity of the Khmer.